My WWWD tee shirt has arrived! No, it wasn't a freebie, I paid actual hard earned cash for this sucker, and I love it. It is now my official Tuesday night volleyball shirt. 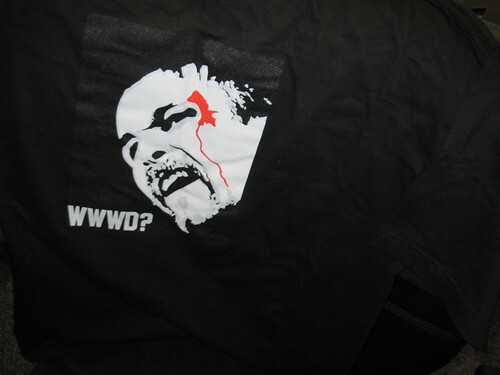 What would Wendel do? I like to think he'd be rather proud of my selection. Get your funny hockey tee shirt today at http://www.puckinghilarious.com/. My Ovie shirt (which is resting until March) took about a month to arrive, but it fits just fine! I'd advise to anyone going for that model that you go with a brighter colour than maroon. Mine came yesterday. What-would-Wendel think of that?? I also got a Hackey Night shirt. I got that one in blue.